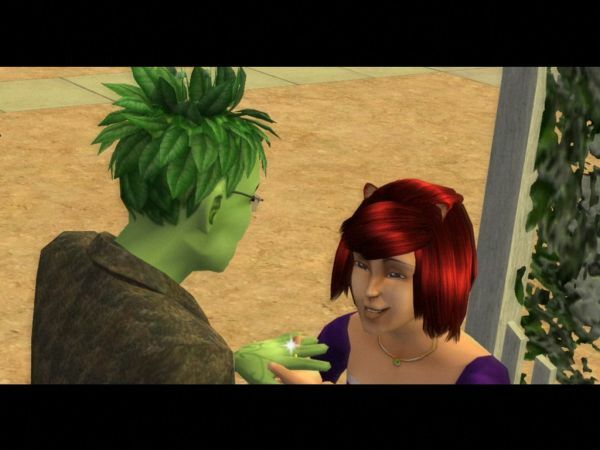 Marrying a magical robot catgirl makes a lot more sense once you’re a vegetable. But that was my sims’ Sunday. How about mine? I think I slept more than nine hours this night. And that does not include the half hour I was up in the morning before I crawled back to bed. It seems to me that the new MindFlow meditation actually makes me more sleepy, instead of less sleepy as Holosync did. Or perhaps that’s just my mind playing tricks on me. I have a bottle of soda standing beside my bed these nights. (Well, technically it is a mattress rather than a bed, but it serves as a bed for me.) Each morning when I wake up, I am so dry that they cannot even swallow unless I drink something first. I could of course use a bottle of water, which is healthier and practically free. But what’s the fun in that? Lukewarm water is just disgusting, but soda is always soda. Having already slept so long that I had lunch for breakfast, I soon made my pasta dinner for lucnh. (Hey, it is Sunday, why not?) While I was making food, the landlord’s grandmother was doing something garden-related outside. She is in her 80es now, but arrived with a bike and worked for a good while. Â She probably has the utmost contempt for my yard skills, and rightly so. Even the road and parking space could need some serious raking after the ravages of the over-eager snow plow. And dry leaves keep piling up on the lawns. The good news is that as long as the grandmother (and former owner) can still garden here, it is higly unlikely that the house will be sold. I could still be replaced with a better tenant, of course, if the place gets too ugly, inside or out. This reminds me that I really should get rid of more stuff. Â Like the issues of New Scientist that I did not find time to read last year. (I did not renew the subscription, at least.) Or the crate of comic books I brought with me from the old apartment, when I had given to the second-hand store the hundreds and hundreds of comic books I was not absolutely sure I would want to read again and again. Â Or in other words, I only brought with me those I knew for certain that I would read. Â Of course I have not even opened them. If I don’t read comic books on a Sunday, what do I do? Â I have continued to play my Sims 2 “Build a City” project, but it requires only a fraction of my attention. Â Today I have started blogging it, which is a lot more work. Pictures to scale and cut and upload… and uploading anything is a trial in itself. Â Even though I have a broadband connection, uploading is hit and miss. Â Now this is ADSL, not true broadband – it is much broader for download than for upload. This surely fit most people, since they consume a lot more than they produce when it comes to the Internet. But it is worse than just that. Â Even the current upload speed should easily be enough for my needs, but both pictures and even text often time out. Â I have to disable the firewall again, and even then it is not a sure thing. It could be a Dreamhost problem, I suppose. In any case, the new site for the Sims 2 challenge is up finally. Â You can find it here, not that I think I have any shared readers between the Chaos Node and my sims imperium. Still, I mention it because it took its sweet time getting started. Hopefully future updates will take less time, now that I have a site for it and have found a form I like. Oh! And I discovered a new online roleplaying game, Ether Saga Online. It is one of those Asian free-to-play games, less detailed and lifelike than EurAmerican MMORPGs like City of Heroes or World of Warcraft. On the bright side, these Asian games run on cheap or old computers. And as I said, they are free. Â This one certainly looks Asian in every way, but it is in English and both of the servers are in the USA. Unfortunately, there is not at all time to even try the game, much as I would have loved to. Â I don’t even have time to play the games I already have! Â But this must be a wonderful time to be a NEET (Not in Employment, Education or Training) and a Hikikomori (someone who never leaves their room). Â Speaking of which, the founder of my Sims 2 city is a former NEET and Hikikomori, and references to otaku culture pop up repeatedly in the story. Well, that should be plenty for one day! This entry was posted in games, slice of life and tagged Sims 2, sleep by itlandm. Bookmark the permalink.